Our Cathedral is served by three choirs and many talented cantors and instrumentalists. 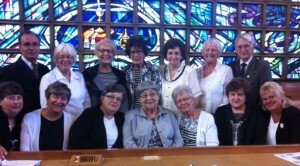 Our largest Choir regularly sings during the Sunday 10:30 am Mass from September to June. It also enhances the beauty of our Liturgies at Christmas, during the Easter Triduum, and at all special Parish and Diocesan Liturgical celebrations. Members volunteer their time and talent. The Director, instrumentalists and cantors are reimbursed for their professional expertise. 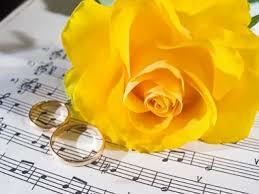 Music and song enhance the solemnity of our Liturgies and raise our hearts and voices to God. 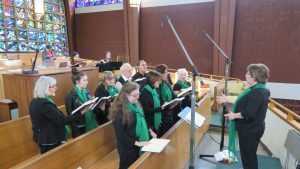 This Choir of volunteers and cantors leads us in music and song each week during the 8:30 am Sunday Mass and at other Liturgical celebrations. 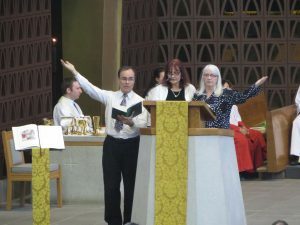 It also assists us in making our Liturgies beautiful and joyful celebrations of Faith and Worship. 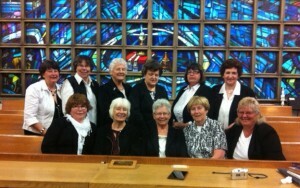 This group of volunteers donates its musical talent to enhance the solemnity and the beauty of our Funeral Liturgies. The members donate their time and talents to serve the needs of those who are grieving the death of a loved one during their time of loss. These policies and guidelines have been developed in the best interests of our bereaved families and for the well being of the Cathedral Parish Community and its Music Ministers. 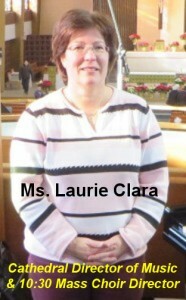 Our Music Director, Laurie Clara, is ultimately responsible for the observance of these music guidelines. 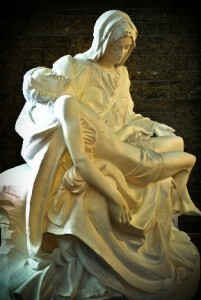 She, however, also reserves the right to permit different family requests or to accommodate the special talents of individuals, respecting the uniqueness of each Funeral situation. Instrumentalists provide all the music and singing during the Funeral Liturgy. 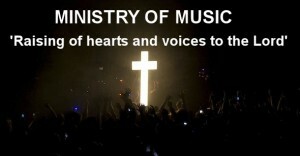 participate by joining with our choir during the Funeral. a. The music selected for a Funeral should never be secular but must respect the sacred nature of the religious celebration and follow the guidelines of the Church’s Liturgy for Funerals. The family usually chooses from an extensive list of appropriate hymns which is provided to them in preparation for the Funeral. b. The hymns chosen by the family should, for the most part, be selections in which the entire congregation can participate in singing. c. Bereaved families must consult directly with our Music Director and not with invited guest soloists or singers about musical requests for the Funeral. As the Cathedral’s representative, the Director will make the decisions in keeping with the Church’s Liturgical norms regarding the appropriateness of requested music and hymns. d. Hymns which are sung by guest soloists before or after the Mass must also respect the sacred nature of the Funeral Liturgy . The practice of the Parish is to support and uphold all decisions made by the Director regarding the appropriateness of your musical choices and/or your specific requests. This Ministry assists couples to prepare the musical pieces and songs for the celebration of their Wedding Mass or Liturgy in our Cathedral. The Director will acquaint the couples with Catholic Liturgical norms for weddings and Parish policies regarding musicians and singers. * N.B. 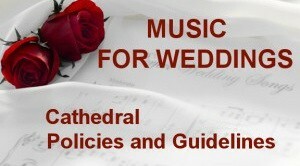 Couples are asked to refer to the complete list of guidelines and policies regarding music for weddings in the Cathedral which is provided to the couples by the Cathedral Rector when they first meet with him to prepare for their proposed wedding. 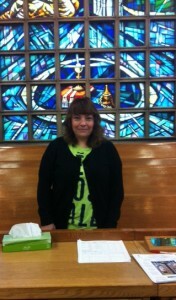 Our Coordinator is Evelyn Kushnier. She is responsible for the observance of our music guidelines and policies for all weddings that are celebrated in the Cathedral. Please contact her by telephone at: 475-3419 or by e-mail at: notes_2u@yahoo.com. to discuss music for your wedding. She will answer your questions regarding music for your wedding and advise you accordingly with regards to the selection of accompanists and cantors. It is our policy that couples choose Organists/Pianists and Cantors from St.
Patrick’s Cathedral at all weddings that are celebrated in our Church. 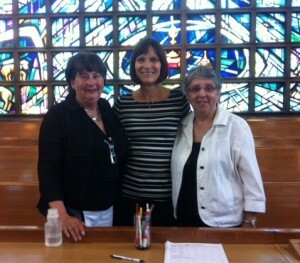 meeting with the Cathedral Rector. a. The music selected for a Wedding Mass or Ceremony which is celebrated in the Cathedral should never be secular but appropriate to the sacred nature of the religious celebration. b. There are many traditional and contemporary selections available. 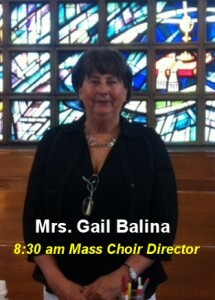 c. The Music Coordinator will assist you in your choice of music which is in keeping with the Church’s Liturgical norms. d. The musicians will meet with the couple prior to the wedding.